Orthopedic Dog Bed - Help For A Pet With Mobility, Arthritic, Or Age-Related Joint Problems! 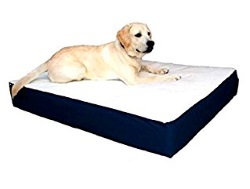 Providing an orthopedic dog bed is one of the caring steps a pet owner can take to ease the challenges of a dog that is experiencing arthritic problems, hip displaysia, or other joint related soreness. That being said, a dog of any size, with or without any health issues, won't be able to resist the extra comfort that these beds provide. Plus, for larger or heavier dogs, the extra thick cushioning provides more support without bottoming out. 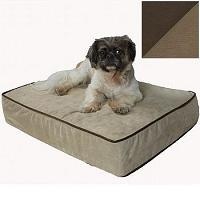 Most of the memory foam dog beds are available in a variety of sizes, shapes and attractive fabrics. Generally, they have covers that are machine washable as an additional convenience. The orthopedic pet beds featured below are of high quality and specially designed with your pet's comfort and well being as the top priority. They vary in price according to size and the depth of materials in the support cushion. Irresistable comfort for any dog! Provides maximum support for arthritic dogs - all others will enjoy it too! Constructed with dual density foam to give a full 6" of support!